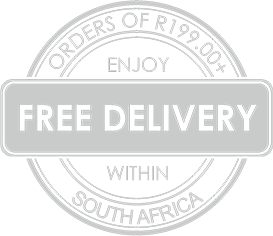 Premium Quality Coffee Beans - Unbeatable Pricing & Free Delivery in SA! Coffee beans of the highest quality. A coffee blend made with passion and obsession for the creation of the ultimate coffee sensation. A coffee beans blend exclusively designed to meet the demands of the absolute coffee connoisseur. The result of decades of experience in coffee blending and roasting. A smooth fruity-floral & bitter taste, accompanied by deep and amplified coffee aroma. 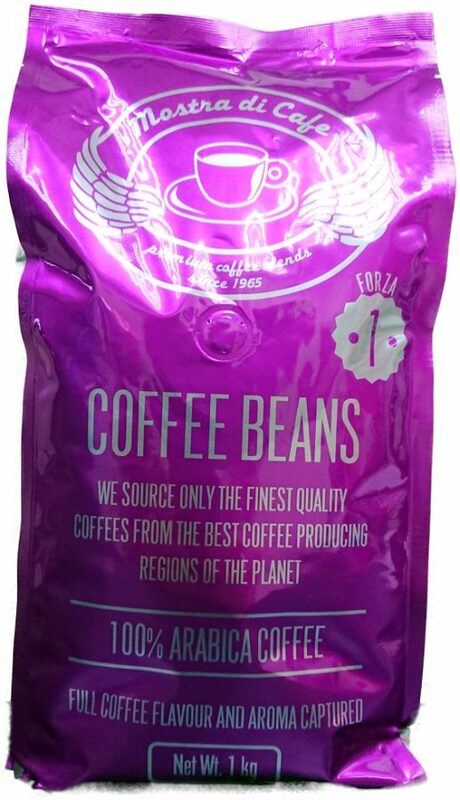 A unique coffee bean blend – result of a carefully selected variety of 100% Arabica coffee beans, roasted to perfection. 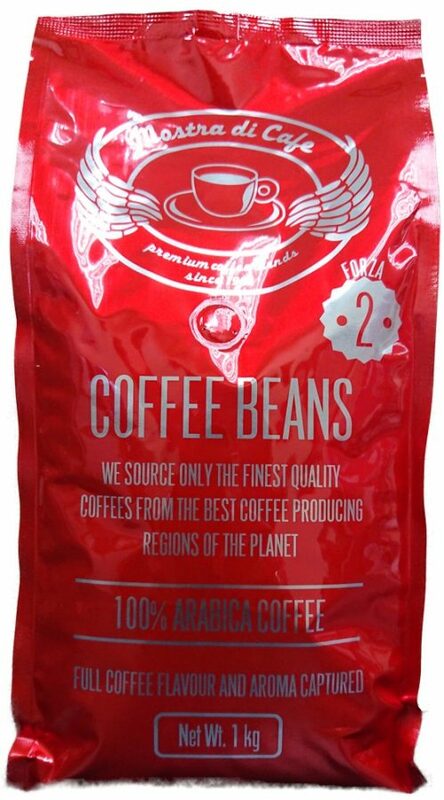 A medium to dark roast espresso blend that can only be compared with the best global coffee bean brands of the world. Coffee Origin: A selection of 100% Arabica coffee beans from South, Central America & Africa. A well balanced coffee bean blend of high quality. Long lasting flavour, intense aroma & velvety crema. An espresso blend that is designed for the coffee drinker who prefers a less intense approach to coffee, but still seeks perfection in coffee taste. A slow, medium-dark roast, Italian style & velvety coffee bean blend. A coffee bean blend that often makes imported Italian coffee drinkers wonder why it took them so long to discover it. A very popular coffee bean blend amongst female coffee drinkers as well as people with sensitivity towards products containing caffeine! A selection of medium roasted South American coffee beans mixed with dark roasted African coffee beans. 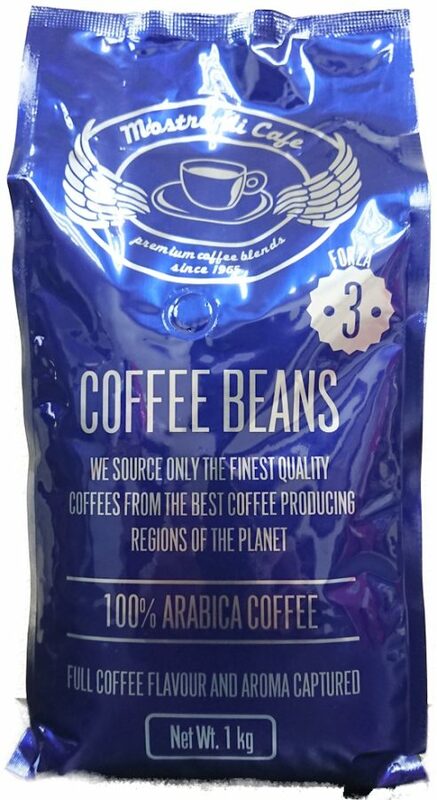 A coffee bean blend of superb quality, designed to offer an underlined but absolutely enjoyable coffee taste, accompanied by rich golden dark crema and intense aroma. On over all a smooth & tamed African coffee sensation. This coffee bean blend will take you places since it is an espresso blend, designed for the true coffee drinker who likes balanced coffees but also…a bit of a kick in his cup. Extremely popular amongst restauranteers & coffee shops in South Africa! How to judge a cup of coffee! Detecting the properties / taste elements if you will of coffee takes time & practice. It is essential for you to possess some sort of ability to sense & taste things (for example if you are a smoker, consider these abilities compromised already). If the coffee you are about to taste is not freshly roasted & packed – you have a massive disadvantage, so step no1: get busy evaluating FRESH COFFEE. All though I consider filtering or French pressing the coffee to be an excellent way of brewing, I leave the brewing method to your discression. Once the cup is in front of you and before you get busy with the process, consider the main & basic 5 elements of evaluation: Aroma, Body, Acidity, Flavour and Finish. Bring the cup of coffee under your nose & take in the aroma. Does it tastes intense or mild? Can you smell nuts, chocolate, fruits, spices herbs, flowers? Take the 1st sip of coffee and try to feel the thickness or thinness of the coffee’s body….something like the difference between full cream milk & skim milk. Take a 2nd sip, swirl the coffee in your mouth and try to identify the texture of the coffee. It can be creamy, oily, slippery, buttery, silty, watery, or even salty in some cases. Take a 3rd sip, this time trying to access one of the most important elements of every decent cup of coffee: the acidity – the bright, tangy quality experienced when tasting coffee….something similar to the taste you get in your mouth when bighting an apple. Usually, this taste element comes with citrus or berry tones. Take the 4th sip, this time trying to pick up the flavours the coffee might be surfacing to your pallet. There are some basic families of flavours like nuts, chocolate, fruit, earth, caramel, flower, herbs or spice. The last and 5th sip’s aim is to allow you to access the finish the coffee you are tasting offers once swallowed. If the flavour disappears right away, the finish is short and if it lasts a while, the finish is considered long. Coffee tasting is like wine tasting and nowadays – with fresh coffee becoming more and more available & affordable to all – the culture behind enjoying a good cup of joe is on the rise. Choosing the right coffee roast! The raw – un-roasted coffee bean is yellowish green in colour, dry and hard. As the bean gets roasted, the colour starts changing to light orange and then to a light brown colour as it approached the 1st crack. At around this stage, a great deal of the coffee bean’s moisture is extracted and the coffee bean can be considered light roasted. As the roasting process carries on, the coffee bean gets puffed up and darker in colour. As we are approaching the 2nd crack of the coffee bean, we have entered the medium roast stage. The coffee bean is dark brown in colour & quite dry. Anything after this stage is considered dark roast. The coffee bean appears to be fully puffed, very dark brown (bordering black in some instances) and oily. As the roasting progresses (from light to dark), the basic elements of the coffee bean – being acidity, aroma, flavour & body – changes. The darker you roast the more compromised they become BUT having said that, it is also important to note that each coffee bean type has different limits & reacts differently to roasting. In general lines and as far as roasting is concerned, one can accept that the darker the roast gets the bigger in size and lighter in weight the coffee bean becomes. This means that a scoop of light roasted beans will offer more caffeine than the same scoop filled with dark roasted beans BUT if you were to do the same exercise using weight instead of volume, the dark roasted beans will offer more caffeine in the cup. Lastly, one needs to also take in consideration the type of coffee bean being roasted BECAUSE different types of coffee bean not only behave differently when roasted but also offer different caffeine content, for example Robusta type coffee beans offer nearly double the amount of caffeine than Arabica coffee beans. So, one could assume that there are different coffee roasts for different folks! Reality prompts us though to consider naming “most popular roast” the one that clearly appears to be selling faster. As far as South Africa is concerned, the roast that gets the title is the medium roast! Arabica & Robusta coffee beans! Arabica & Robusta coffee beans are the two main species of coffee. Arabica coffees hold the 70% of the global market’s consumption while Robusta the remaining 30%. Arabica type coffees appear to hold more sugar & oils that lead to their taste characteristics being Sweet, Fruity and Zesty Acidity while Robusta coffees reveal Woody & Earthy notes with lower acidity levels. Arabica coffees are commonly found to be used in single origins blend while Robusta coffees are often used as “fillers” to coffee blends and the coffee of choice for many instant coffee manufacturers. Arabica coffees cost more than Robusta coffees and this is because Arabica coffee trees can be found mostly in high altitude areas, they are more susceptible to pests, require more attention by the farmer and produce lower yield. Robusta coffee trees on the other hand, grow in lower altitude, they are more resistant to pests requiring less attention from the farmer and yield higher production. Another big difference between these two types of coffee is the caffeine concentration: Arabica runs at about 1.5% concentration while Robusta runs at about 2.7% concentration. As far as appearance is concerned, Arabica coffee beans are more oval & flat while Robusta coffee beans are more round in shape. By the end of the day, one needs to take in consideration that the amount of Arabica coffee bean fans appears to be as big as the amount of Robusta coffee bean fans. Such realisation could easily prompt us to consider the process of choosing between these two – different in many ways – coffee bean families a simple matter of taste!